Manually Operated Pump System | Overview | Daikin Lubrication Products & Engineering Co., Ltd.
• Simple system results in low equipment expenditure. • Suited to medium-scale equipment and facilities that have long lubrication intervals. • Simple operation enables easy lubrication. A “pump indicator” is integrated into the manually operated pump to check the planned amount of lubrication. 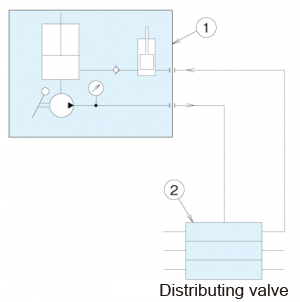 By installing an extra discharging port and connecting this to the return port of the pump when planning a 1st distributing valve, the amount discharged from the distributing valve can be checked on the pump indicator. Note) When this system is used for oil, configuration should be limited up to the two-stage progressive configuration.